-By Olav in The Netherlands/Belgium- In the winter of 2015-2016 I restored this pretty rare machine for a friend of mine. The frame (# 498xx, i.e. 1933) he bought a few decades ago containing a Big Four engine. He sold that engine and later found a 1933 model 19 engine (# 551xx, 82x113). He didn't have much else for the bike but gathered bits and pieces to complete it over the years. A NOS pair of (correct type) girders came from someone in the far north of Holland, correct upper fork yoke from a friend in the UK, the beautiful petrol tank was found on a WD16H for sale at a Dutch trader, and he was able to make a deal and exchange it for the correct tank to suit that bike, etc. etc. To sum up: all the bits and pieces came from different sources and places and to me was the challenge to turn it into a complete and authentic looking bike. 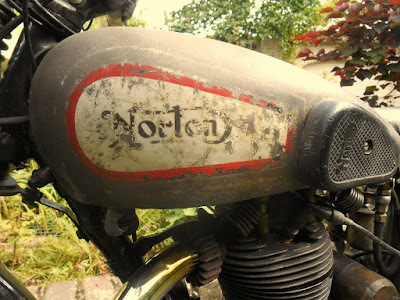 The petrol tank had fantastic patina: all the chrome had come off but it was solid and the grey panels and norton logo looked original while the black striping had long ago been restored using red paint, but that gave it a nice individual touch. 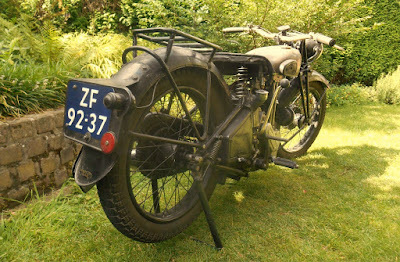 So there was no doubt that it should remain that way, and the rest of the bike made to suit that authentic appearance. The oil tank had been painted black but underneath the paint some original chrome plating had been conserved, mostly where the striping had once been. When cleaned up and after application of red striping it matched the petrol tank beautifully. Two other parts were left mostly in their original paint: the number plate bracket, which on top still had a very nice logo from a dealer, although illegible now, and the primary chaincase. Allthough that needed some repair and a modification (the hole for the footrest didn't match up). I just dabbed the repairs with a brush and some paint. All the other parts were cleaned to bare metal and repainted. The mudguards were brand new, so they really needed a few tricks to make them look old (like hammering dents, using a blowtorch, 'dusting' fresh paint, etc.). I had an old saddle cover which was servicable again after restitching most parts. I made clamps from spring steel strip for the wiring, etc etc. Lots of work but it makes for nice details on the bike. Everything just had to match up to that petrol tank in style, that was the objective. 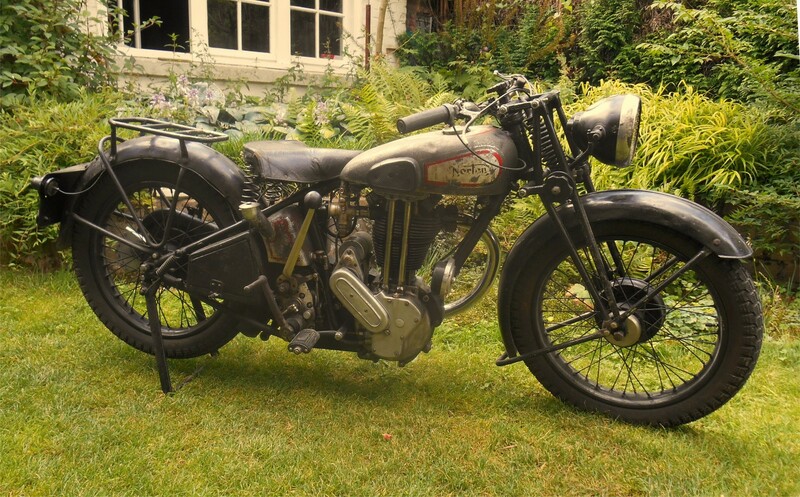 The only mismatch is the brand new exhaust pipe and silencer: no alternative for that alas, but if someone has some faded originals he might sell: yes please! As the bike is used often, they hopefully will quickly gather some wear and tear. I completely rebuilt the engine. 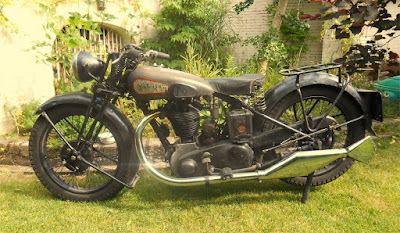 A new BSA piston was used: fits perfectly and adds a bit to the compression ratio. The engine is highly modified by the way: bigger valves, hairpin springs, and also a positive oil feed to the guides. Someone made a hole just behind the inlet pushrod tube, tapping into the feed to the rear of the cilinder. From there a copper line is going up to the head were it attaches to a splitter with seperate feeds directly into the guides, with the flow adjustable using screws and shims. Very nicely made, I think it must have been done in '50s, probably not much later because by then replacing coil springs by hairpin would have been a bit backwards? The guides are made from bronze by the way, technically/theoretically not the right material to use in cast iron heads; heat transfer between these two metals is not optimal. But in practice it may be adequate enough, especially when cooled a bit by a positive oil feed. So I left them in place. Clearance was fine so I didn't expect the valves to seize easily. And it's easy enough to replace them should they wear quickly. The hairpin springs were chrome-plated and all four of them broke within the first few 100 miles of riding. Maybe because of the plating? Or just from old age? Anyway, I replaced them with new ones, of the same type as used on the cammy Nortons. After completion I used it for around 600 miles, as was agreed upon with the owner. To assure reliability, for one thing. There's always some kind of technical issue showing up within a few hundred miles (like those hairpin springs), but also to properly run in the engine. This takes, in my experience, at least about 600 miles, and it makes a big difference. At the start, with everything still new, the engine feels rough and stiff, while after several 100's of miles you will really notice it freeing up and getting smoother. Only after running in you can really properly adjust the carburation, and then, by considering fuel and oil consumption and performance you can assess the state of tune of the engine and consider how well the rebuilt went. My apologies to elaborate a bit on this, but I often wonder why people spend so much money and effort on rebuilding an engine when it will take many years for them to get the bike run-in properly as most people rarely ride their bikes. They would be better off to quickly run-in the engine or even maintain the worn condition of the engine as it will often be much easier to start an much smoother in that condition, providing it is set-up properly. Anyway, oil consumption was hardly noticable (except for a bit of waste in the first few hundred miles), also helped, I guess, by the second oil scraper ring on the BSA piston. Fuel consumption is around 1 liter per 25 km (71 miles/imp. gallon), which is quite OK for a 'tuned' 600cc thumper. Top speed isn't revolutionary (didn't try, but it speeds up easily to around 110 kmh / 70 mph), but the way is stomps around like a brutal beast is of course impressive. The engine, with it's huge flywheels and long stroke, was made for sidecar use and that's how it feels like: torque galore, not hammering but smooth, realy easy to ride. It has four gears, but ridden solo, two would have sufficed. Acceleration is good, but my '38 ES2 is quicker (as you would expect). Anyway, I'm quite satisfied about how the bike turned out, and so was my friend to whom I had to hand it over again after enjoying it for a few months. But that's how it goes, on to the next project!